I dug out some of my favorite greens for this one. It's posted in my Etsy shop, and I've got backing and borders for the next koala quilt ready to go. Really all I wanted was just a simple garter stitch-ish pattern for a shawl for making my super overspun green handspun wearable. I downloaded Mayhem (rav link) and discovered a challenging, fun, think-y shawl for people who are up for that sort of thing right now, which I am not. I am forging onward despite basically slow-motion swimming through a sea of red flags (fancy cast-on! mirrored charts! needing to know what needle size you're using! argh!) purely because making a new decision about what to knit is simply too much work, which is a lot like deciding not to cancel a wine of the month club because you can't afford a stamp for the envelope*. The positive side effect for the monumental effort it took to find a needle sizer is that I found some fabric I'd been looking for and a pair of socks that is finished except for the toe grafts that I had 100% forgotten I'd knit. (Those were under a pair of socks that is finished except for the toe grafts that I did remember.) I vaguely remember joking many years ago about knitting a pair of socks in a fugue, because I was supposed to be knitting something else. It's nice that my mental deterioration is finally catching up with my alibis. One of the many delightful benefits of growing older. This one was just my speed. Stockinette, stockinette, stockinette, easy lace, deviate completely from the pattern and throw in a ruffle, and wham! shawl. Charm squares for another baby quilt, this one likely for the Etsy shop. Let's just say that the color scheme is not my jam, although I do really like the purplish butterflies on pinkish background. This is River Rocked on Shetland, I want to say? Yeah? That I tried really hard to not overspin in the singles but then plied to the fullest extent remotely reasonable. We'll see how that turns out, still working on some singles. I'm squirreling away bits of pretty fiber for the Tour de Fleece, which happens in July. I may not a) be able to wait until July, or b) remember, once July rolls around, that I was supposed to be doing the Tour de Fleece. The second one was a result of the logic of: can't behave well in the car, huh? Well, we're passing WEBS, so let's see if you won't embarrass me in public! Ha! Because at least then I'll have some fiber! Come for the poorly-lit pictures of basic projects, stay for the professional-grade parenting tips, is what I say. *Where in this analogy, money = mental energy. Case in point, in that last sentence, I spelled the last four words wrong 2-5 times each before typing them correctly. No 'e' in analogy! Not anywhere! It was really bad. I was trying to go off of the white squares with the sketchy circles, but it just was not working. It's a pretty fabric, I swear. This one is probably scuttled for good. Which is cool for a Dour-Peoples-on-the-third-moon-of-Jupiter vibe for a day or two, but we were on about month 4 of the whole thing and I needed some orange and pink. And then I needed to scrape together some spending money for the backing fabric, because while I had some pieces big enough (and, come to think of it, could have just pieced something that would have looked okay), the colors weren't right. Turns out the print on the backing is verrrry light. I'm developing a huge stack of charm squares for making more of these simple little baby quilts, and along with this backing I bought several other longer bits that should make nice backings for other such quilts. These quilts are just under a yard wide, so about a yard and a quarter is enough to back one with some fabric left over. Leftovers are very important for several grandiose plans that are hatching. I handed this one off to one of the happy parents well after the little one showed up, as unceremoniously as ever. (I worked for many hours on this! Then I put it in a paper bag! Here!) I'm not sure it's to the parents' taste, but it is a) not the color of mud, and b) at least more cohesive than that first attempt, so. This quilt used the same layout as the orange one I made a couple of years ago for the older kid. Each tumbler measures 6" at the longer base and is 6" tall. I laid out all the squares on my design wall and across the couch a long time ago, then sewed the rows together and put it aside. Wish I had noticed the long run of darker reds starting in the upper right corner. There are a couple of things I'm not psyched about in terms of the layout of this one, but if I'd slowed down to contemplate all of that, it wouldn't have been done on time, so better done than perfect. The back has three rows of half-size tumblers inserted toward the top. I like to make the back asymmetrical so that you can tell which end is the top of the quilt as you're putting it on the bed. Like the previous one, I quilted in the ditch over the whole quilt, then echoed each ditch line twice on either side. For the batting I used Quilter's Dream Wool in a twin size, which had some terrible reviews on Fabric.com because of issues they seem to have had when some of their product didn't get some part of the finishing process. 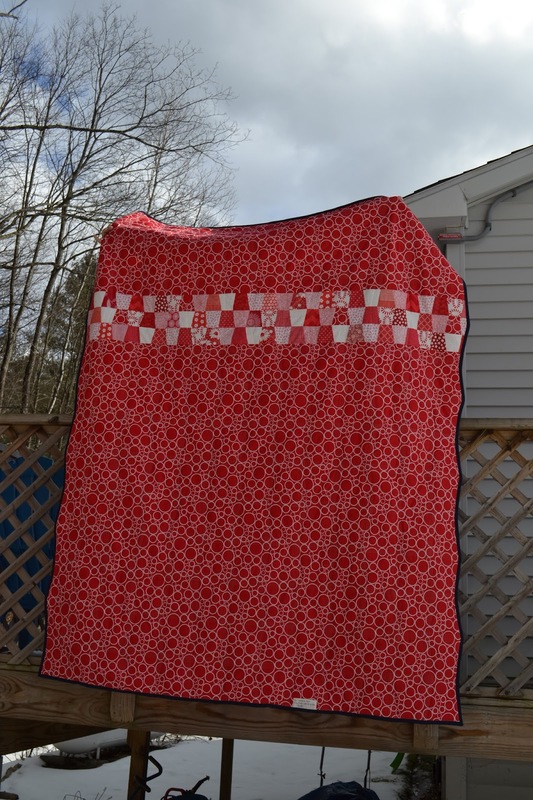 I used that batting in the other tumbler quilt and have been really happy with it, so I decided to give it a chance and resigned myself to ripping the quilt apart and re-doing if necessary. Luckily, it went through its first wash just fine, and I don't anticipate any problems with it. It's a pretty high loft and is very warm, and the orange quilt has broken in very nicely. As luck would have it, I have enough navy bias binding from the last tumbler quilt to bind the whole Red Tumbler. Occasionally there is an upside to being a pack rat playing a long game. Luck would also have it that on the day of the deadline, I have three hours unscheduled this week due to alternating-week stuff getting messed up. Worst case scenario, I spend those hours finishing up the hand sewing of the binding. As for tonight, I hope to finish the quilting - one more horizontal seam to do (5 rows of quilting) and then along all four edges, two lines each. I may get it done before bed, I may not. I was smart, over four years ago, to knit the second end first and then set it aside for grafting - no worrying about guessing how much yarn I'd need, and when I felt done I was actually close to being done. Blocking worked wonders and it's plenty long enough now. The pattern is Kernel, from Knitty. Yarn is Malabrigo sock in Solis, purchased way back in 2009. I originally started it before my second child was born in 2014, hoping to get it done before she was born. Then I didn't, and I'd pick it up here and there on long car rides, which had become much fewer and further between. And then a few weeks ago, I decided to get it done and zoomed through the last couple of repeats. The working title is "hand-dyed with circles." I may come up with something better. Right now I'm making a bunch of circles in various ways. Thread, beads, applique. The big circle, visible in the top picture, is from a quilting hoop. I kind of like it, and may quilt along it, but it does change the whole look of things. Generally I've been adding one thing per day - a set of stitches or beads - and I'll keep trying to do that until it feels done. I'm also thinking about finishing techniques for the edges. Will probably not do a traditional binding, but I'm not sure what I'll do instead. The big push right now, though, is to get this twin-sized quilt finished asap. I set it aside with the top rows finished but not sewn to each other and the backing still in many pieces. Now it's basted and there are some quilting lines finished. This is the same pattern (plan, there's no real pattern) as the orange twin tumbler I made several years ago, which calls for five lines of quilting at each seam. My rabid and dedicated fan base has pointed out to me that I haven't posted here in a good long time, so here I am! I love my wheel precisely as much as I thought I would. I love spinning and I love handspun. Details for most of these are on Ravelry. The last blue one will be a 2-ply, and I just finished this recently, so it will sit for a bit before I ply it. This was pure expedience - the entryway of my office building is dreary and drab, so this is just something to look at. My quilting mojo is nowhere to be found, so I did an image search, came up with something that looked doable, and did it. Whiz-bang. I tried out a new finish on the binding - it's a machine finish, with a fancy stitch. I used white thread on the white parts of the blocks and a teal thread on the colorful parts, including to finish the binding. I'm also in the process of making a baby quilt, for a baby who was born, um, about two weeks ago. After dragging my feet on the design for ages, I scrapped the whole plan and went with a simple warm/orangey palette plan and the top is done and I have batting that fits and the only possible backing is blue. Which isn't ugly or horrifying, it just doesn't fit the whole feel of the quilt at all, and I'm trying to decide if I care. As I wait to come to this decision, away I spin on the next thing.